Happiness is a slow, serendipitous lunch of grilled chicken in the dappled shade of the guava tree on a warm Sunday afternoon. With my foot firmly on the brake till Monday, my day dawned later than usual despite the robust renditions of the koels (cuckoos) residing in the fruit trees outside my bedroom window. Sunday papers read, floating on a ribbon of blues meandering through the house (from my better half’s eclectic music collection), the mood was smooth for a morning of leisurely cooking. I live in a city rich and romantic with the history of spice trade, which drew all manner of European colonisers (Vasco Da Gama being among the first few), who went on to build whole empires in India. The baroque, spice warehouses in the old part of town, with their moss-stained, whitewashed walls and red-tiled roofs, line the narrow serpentine lanes evoking the sights, sounds and smells of the past. I’m fascinated and inspired in equal parts by the aura of faded grandeur that surrounds them. Mounds of dry ginger, garlic, cumin, cassia bark, cinnamon, cloves, cardamom and star anise in jute sacks still crowd the storefronts of the few functioning warehouses, saturating the air with their odours. In such a place, my excited synapses naturally conjure up images and ideas of of food, which I stash away in a corner of my brain to be retrieved later. They are my muse. There are recipes in my memory that unintentionally marry my current inspirations. 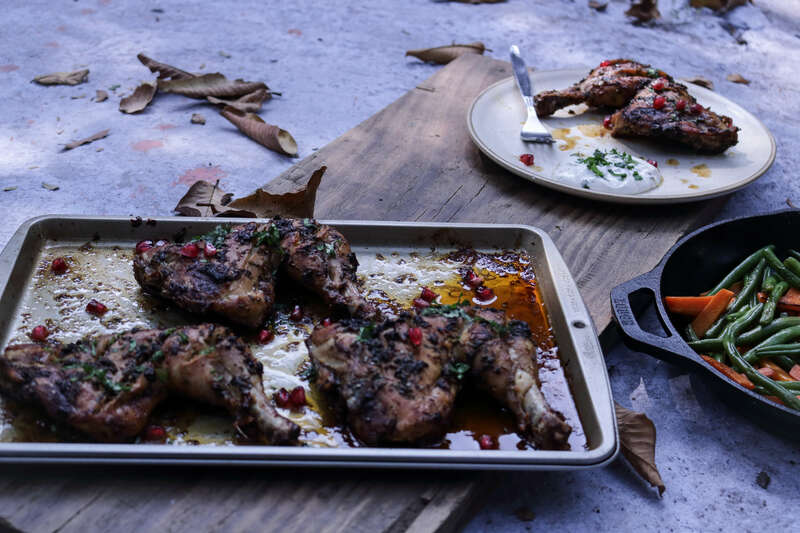 And once in a new moon, a delicious result like this grilled chicken recipe emerges from this fusion, which validates the time spent daydreaming of food and rambling on on this blog. On such days, the satisfaction is deep and complete, like a scientific theory being proved in practice. 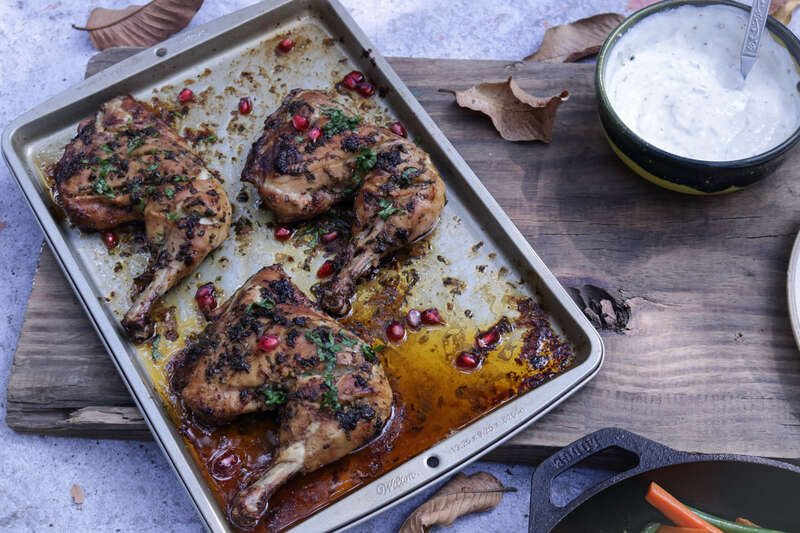 Succulent chicken thighs smothered with a wet rub of garlic (and lots of it), fresh and dried herbs and a healthy sprinkling of spices, then grilled in the oven, and eaten dunked in a cool yoghurt sauce, seemed like a great dish for a lazy Sunday lunch. 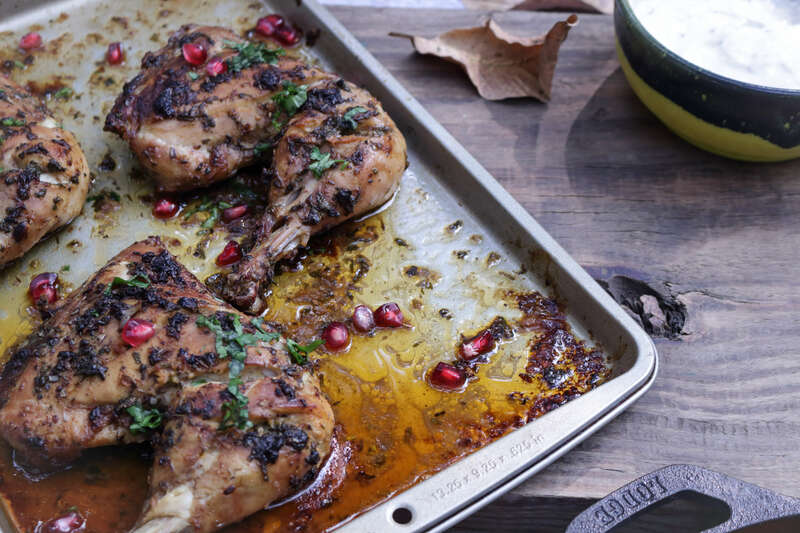 All the hard work of working the chicken was done by the marinade made with regular store-cupboard ingredients like dried oregano, thyme, smoked paprika, powdered cumin and cinnamon pounded in a pestle with fresh coriander, garlic and lemon juice, all doused liberally in olive oil. Sitting in the fridge overnight or at least for a couple of hours in this herbal unguent, the chicken plumps up with flavour. I had to simply arrange them on a baking sheet under the broiler in a very hot oven and cook for 10-15 on each side. The result was juicy, grilled chicken thighs, charred and smoky on the surface with moist meat inside. The lemony tang, the mellow garlic, the hot paprika and the salt work black magic with the bird’s juices to yield a precious sauce so savoury on the tongue that you will lick every last drop of it off your fingers, I promise. No lighting the barbecue, building a fire or wielding tongs over intense heat for this grilled chicken; it’s a recipe for loungers cooking with a glass of chilled chardonnay in one hand. But if you’d like to, you could go with a stove-top grill or a barbecue; it is grilled chicken after all. While it needs no elbow grease, there are a few things critical to the success of this chicken leg recipe. I recommend chicken thighs and chicken thighs only, white breast meat will not stay so succulent since it has very little fat. Do remember to trim off most of the fat from the thighs retaining a little to boost flavour and moisture. Also, use liberal splashes of extra virgin and regular olive oil in the marinade. Be generous with the garlic as well because chicken and garlic are good friends and you’ll never feel overwhelmed by the garlic – it goes soft and loses its sharpness in the olive oil. Finally, season with love making sure the marinade coats every fold and crevice of the chicken. 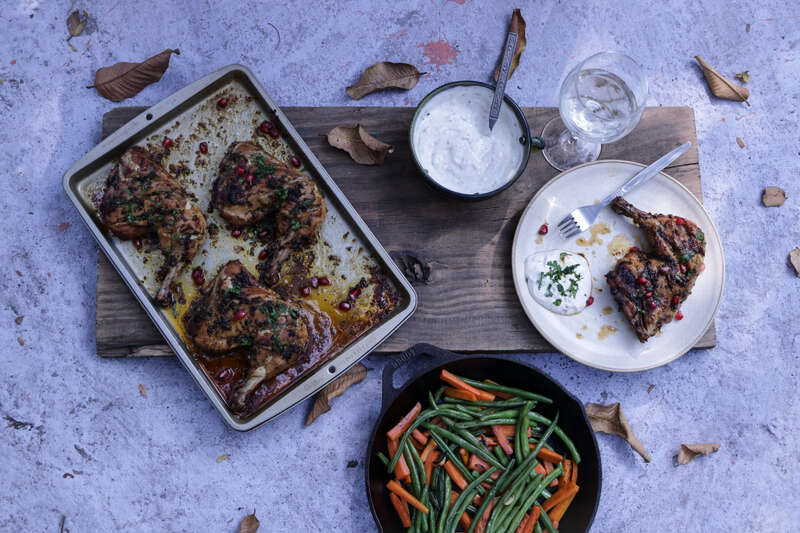 We ate this chicken with a simple garlic- yoghurt sauce (to offset the herbs and spices) and fresh green beans and carrots lightly charred in olive oil. 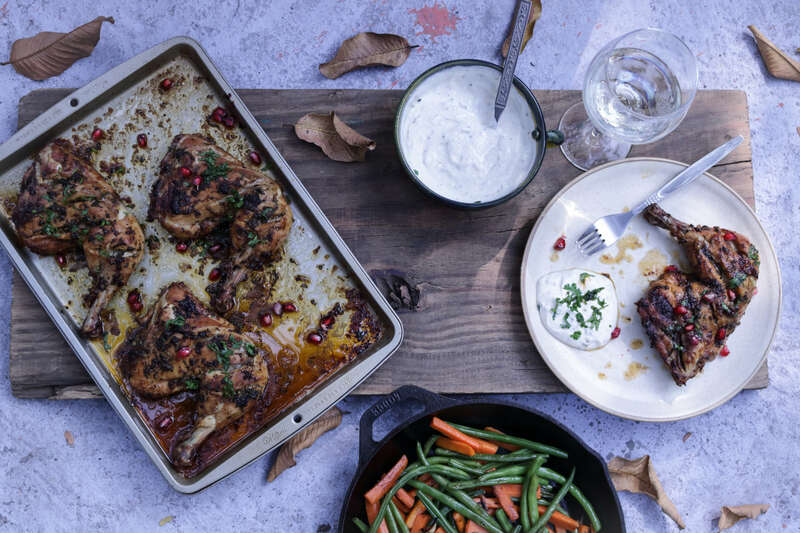 We began with cutlery but soon abandoned the steel as our fingers prised bits of tender, juicy chicken, and picked the sweet, sauteed vegetables to be dunked into the cool creamy yoghurt . For a little while, we were lotus eaters, savouring our meal under a leafy light, gently lulled by the food chirping magpie robins, and the rare stillness of a Sunday afternoon. Wash the chicken thighs and pat dry with kitchen towels. Using a sharp knife, make a few slashes on both sides of the chicken. This will help the marinade permeate the chicken. Using a mortar and pestle, gently pound the garlic with the salt, herbs and spices. Mix in the olive oils and lemon juice. Place the chicken in a wide bowl and pour the marinade over. Rub it well into the chicken. Cover the bowl with cling film and refrigerate overnight or at least for a couple of hours. Preheat the broiler or grill in the oven and spray a baking sheet lightly with oil or baking spray or line with foil. When the oven is very hot, arrange the chicken thighs on the tray, pour any excess marinade over and place on the highest rack. This will help brown the chicken. Cook for 10-12 minutes or till the chicken appears well charred and cooked. Turn over and similarly cook the other side till done. Pierce with a toothpick to check if the juices run clear, a sign to show the doneness of the chicken. Serve with the yoghurt sauce on the side. To make the yoghurt sauce, whisk the grated garlic and powdered cumin into the yoghurt and chill. Cooking time does not include time taken for marination.